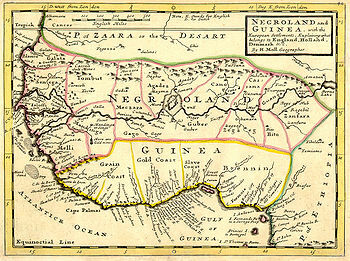 A 1729 map, showing the Slave Coast. The Slave Coast is still marked on this c. 1914 map by John Bartholomew & Co. of Edinburgh. European sources began documenting the development of trade in this region and its integration into the trans-Atlantic slave trade around 1670. The slave trade became so extensive in the 18th and 19th centuries that an “Atlantic community” was formed. The slave trade was facilitated on the European end by the Portuguese, the Dutch, the French and the British. Slaves went to the New World, mostly to Brazil and the Caribbean. Ports that exported these slaves from Africa include Ouidah, Lagos, Aného (Little Popo), Grand-Popo, Agoué, Jakin, Porto-Novo, and Badagry. These ports traded in slaves that were supplied from African communities, tribes and kingdoms, including the Alladah and Ouidah, which were later taken over by the Dahomey kingdom. ^ Law, Robin. The Slave Coast of West Africa 1550–1750: The Impact of the Atlantic Slave Trade on an African Society. Clarendon Press, Oxford, 1991. p. 307. ^ Eltis, David and Richardson, David, "The Numbers Game". In: Northrup, David: The Atlantic Slave Trade, 2nd ed., Houghton Mifflin Co., 2002, p. 95. ^ Law, Robin. The Slave Coast of West Africa 1550–1750: The Impact of the Atlantic Slave Trade on an African Society. Clarendon Press, Oxford, 1991. p. 319. ^ Law, Robin. The Slave Coast of West Africa 1550–1750: The Impact of the Atlantic Slave Trade on an African Society. Clarendon Press, Oxford, 1991. p. 327. Law, Robin and Kristin Mann. "African and American Atlantic Worlds". The William and Mary Quarterly, 3rd Ser., 56:2 Apr. 1999, pp. 307–334.